30 Days of Geek #7: Preferred smartphone platform. And which do you use? It’s an open platform. What I mean for this is that anybody can develop an application for the phone without having to prostrate themselves before Steve Jobs. Note that just because you can write an application, doesn’t mean that anybody does, which is slightly disappointing. The operating system doesn’t treat you as if you’re 6. Every setting imaginable is open for the tinkering. Again, doesn’t mean you should. It crashes occasionally, usually while trying to make a call. No computer would be complete without crashing or misbehaving at an inconvenient time. I currently use a Nokia C5. And what can I say about it? It’s a Nokia. It works, it makes calls and does text messaging, and I can check Facebook if I’m bored on the bus. And that’s what I’ve realised. A mobile phone is still, essentially, a phone. Maybe I’m getting old (I hope not), but maybe it just doesn’t matter so much any more. Posted on November 7, 2010 November 5, 2010 Tags 30 Days of Geek, Apple Computers, HTC, Mobile Phone, Nokia, Touch Pro22 Comments on 30 Days of Geek #7: Preferred smartphone platform. And which do you use? I’ve been in need of a new mobile (cell) phone for a while. My old phone, an HTC Touch GSM (the original) was becoming a bit broken. I was loving it to bits. The USB connector was broken, WiFi only worked half the time, I was starting to get jealous of the iPhone; a number of reasons contributed to the need for a new phone. I did however love HTC. The phones seemed rock-solid and well designed, especially compared to some of the other manufacturers on the market. Other HTC owners I have met over the years agree; I am yet to hear an HTC owner complain about anything but the price. I considered a few phones. The Apple iPhone was high on the list, as were a number of Nokia phones, most notably the N79. I will admit at this point to being a brand junkie; there was no way was buying a cheap iPhone clone. 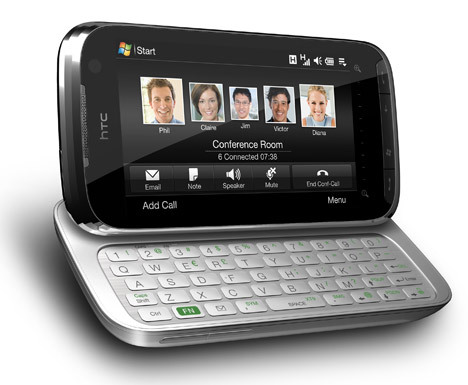 What drew me in to buying the HTC Touch Pro2 was the full QWERTY keyboard and large 3.6″ WVGA screen. I know from owning a decent desktop computer that the most important parts from a productivity point of view are the monitor and the keyboard. They are the parts your body has to interact with, and they should be comfortable. I bought my phone new in the retail box for $887 AUD from a shop in town. I have seen them as low as $650 on eBay, though I didn’t go this route because I wanted a solid warranty. It is a mobile phone with a hinge, after all. Now onto the device itself. It’s far and away the largest and heaviest mobile phone I’ve ever had, or ever seen, or even heard of (apart from the old analogue brick phones). It’s 17mm thick, 116mm long, and 59mm wide. Looking at it another way though, it’s the smallest laptop computer I’ve ever seen. It has a 480×800 pixel screen, as well as a 5-row QWERTY keyboard. Although it is on the small side (naturally) the keyboard is very nice to type with, using both thumbs with the hands wrapped around the back of the device. The screen is also nice, not suffering from glare problems as much as other phones I’ve used (older Nokia phones were particularly bad). If you look closely you can see the individual pixels, but you have to look very closely. It is a very high quality screen. The screen is a touchscreen, and this is one area where they might have done better. The level of touch required to activate a ‘click’ is in my opinion excessive. It’s far more than on my old phone, or the Apple iPhone. It’s still usable however. Battery life, as expected for a smart phone with all the bells and whistles, is miserable. I have to charge mine every day, otherwise the battery does run flat. However, being human, I have to sleep sometime, and it’s convenient to charge it every night. In the box comes a screen protector (very useful, it’s a large otherwise unprotected screen waiting to be scratched), a spare stylus, a USB cable, a wall adapter for charging without a computer, a pair of earphones, and a very nice leather case. The headphones that come with the device serve a dual purpose. The first is as a headset for using the phone, and for listening to music. The second is an antenna for the device’s FM radio. I have to say here that the shape of the headphones is abysmal. They do not fit in my ear at all, and the cable is far too short. If it wasn’t for the fact that they are required for FM radio, I would have just chucked them away. Inside the device is a Qualcomm MSM7200A chipset running at 528MHz. It’s fast. There’s 512MB of storage onboard, of which around half is available to the user to store settings, documents, and optional applications. Program memory (RAM) is 288MB. More would have been nice, but I’m yet to run out of it. HTC has gone to great lengths to ensure every piece of software you could desire is on the device, and they’ve managed well, with a few exceptions. The operating system is Windows Mobile 6.1, upgradeable to Windows Mobile 6.5 some time in the future depending on which carrier you are with. It’s nice, though I notice no huge usability or performance increases compared to Windows Mobile 6.0. HTC also put their custom TouchFlo 3D software on the device as an alternative user interface. If you’re not used to the Windows Mobile interface, you’ll probably find it nice. I just turned it off and used Windows Mobile as Microsoft designed it. The alternative interface does have a few cool features, mostly related to quickly turning communications on and off as well as turning emails into phone calls near instantly. I get the feeling it’s designed for the jetset business executive. As you may have noticed, I’m not one of them. The device is also jammed with other software. A YouTube player is there, as is a choice of two browsers (Internet Explorer and Opera Mobile), Google Maps (with support for the GPS built into the device), and Microsoft Office Mobile. As well as a lot more. I loved the fact that Google Maps and YouTube were installed by default, saving me some download time. One application that is missing is Facebook, although given two browsers and a huge screen, it’s not so much of a problem. Opera Mobile even supports tabs, though having more than 2 or 3 tabs open at one time does slow down the device quite a lot, especially when multitasking with other applications as well. I would have liked a few more games installed by default, although I guess I can’t complain – this is a business phone. Overall, I love this phone, and I’m very glad I bought it. Assuming you have the the money to spare, I would definitely recommend it. WiFi, GPS, Bluetooth, HSPA, it’s all there. Opera slows down when multitasking. Included headphones are awful, and using your own requires an adaptor.